I’m not a great Burton fan — in my annual Top 10s, there’s only one Honorable Mention (EDWARD SCISSORHANDS) among the eight films of his I’ve seen. So it means less from me than it might from others, but I think this is Burton’s best film. It’s a lovely, happy, whimsical dessert of a film. The opening voiceover, about an uncatchable fish, immediately announces BIG FISH as a film about legend-telling and myth-making. The narrator is up-front cagey in a very practiced manner about whether “this story,” meaning the film, really happened this way and whether it matters. “In my heart, I never lied,” Blanche DuBois says, and appropriately, this pastel-gothic fantasy tale where a boy sees his death in Boo Radley’s witch’s eye is set in Alabama. And when the fact becomes legend … well, go see LIBERTY VALANCE if y’all don’t know how the rest of that sentence turns out. Storywise, BIG FISH centers on the relationship between tall-tale-telling father Ed Bloom, played as an old man by Albert Finney and a young man by Ewan MacGregor, and his down-to-Earth son Will (Billy Crudup). Will resents his father’s inability, in realistic terms, to communicate, and his being the star of the world, and overshadowing him with his tall tales and wants “the truth” and all of that. But these flashbacks and myths portray Finney’s life, in a very stylized way, like FORREST GUMP without the silly, sophomoric political allegory. It’s like SOUTHERN-FRIED AMELIE, about someone who exists only to spread happiness … only I did not enjoy myself quite as much as I did at Jean-Pierre Jeunet’s masterpiece (the only time I have ever shed tears from a film’s sheer, infectious happiness; coincidentally, AMELIE was also the last film I saw before September 11.) Like Audrey Tautou, MacGregor’s performance skirts the edge of annoyance in his perpetual over-the-top smile, but that’s who this man is — like his French counterpart, can only walk through the world trying to spread happiness, even in the presence of some of the dark undercurrents in this tale. But those dark undercurrents surrender when Crudup and the present-day scenes finally hit their stride in the last 15 minutes and my realizing that the annoyance I had felt with Crudup’s pill-like character was the point (although I would have preferred this ending to have been the last 13 minutes … there is a funeral scene that I want deleted from the DVD Special Edition). 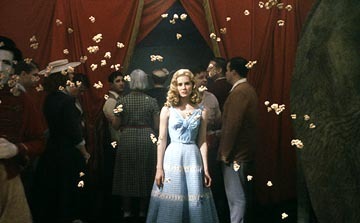 Those two issues — the funeral and Crudup’s character for most of the film’s length — is why I don’t think BIG FISH a masterpiece. Well that, an inexplicably ungenerous and off-key portrayal of MacGregor’s rival. But who cares about such quibbles — what tales Finney tells! And how Burton presents them! Love or hate this film — you will not see sheer, child-like wonder to match these Munchausen-like tales in a theater this year. It’s a kind of heightened offhand surrealism, where the details are exaggerated to the Nth degree, but the film never seems to notice this and so even the freakdom is lovable. 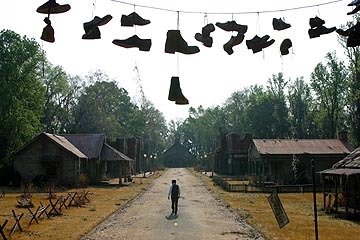 Innocent wonder is maintained even in the oddest circumstances — nobody considers it remarkable that all the shoes in the Eden town are on a clothes line and it’s filmed in a “just so” manner. These tales, or myths, are of a world where small towns have a 10-foot gentle giant (think Andre the Giant in THE PRINCESS BRIDE); where “Asian” (that’s what the passports say) troops are entertained by a pair of Siamese twins whose two upper bodies share two legs; where a route through the woods has a whole hidden perfect town; where men turn into werewolves or fish; where love at first sight stops the world and even leaves popcorn floating in the air while MacGregor brushes past it on his walk toward his eternally intended. Like any flashback by The Teller of Tall Tales, the story gets shaped in retrospective. When telling the story of their lives, even more down-to-earth people tell it to give it an inevitable shape, a teleology or self-providence that things had to turn out as they did because they came out so much the better for the tale-teller. This is especially true in affairs of the heart. I don’t know exactly whether BIG FISH takes an especially polemic stance on this undeniable facet of the story-telling process, which it plainly does emphasize. The film skirts around some of the darker subtexts surrounding, e.g., Helena Bonham-Carter as the one woman who wouldn’t sell her home in the Edenic town. Although maybe you have to know “Travelling Salesman” jokes from the 50s to really pick up on this. (Much as I love BIG FISH, it would be false to why I love it, if it really went for the jugular on this sort of self-deception, as Eric Rohmer does in CLAIRE’S KNEE, CHLOE IN THE AFTERNOON and several others). Among much else, the contrast between the high-key lighting and hyper-real colors in the tales and the prosaic settings of the “realistic” present leave no doubt that Burton prefers the teleological fantasy to dull reality. And in a storyteller, if not a man, isn’t that what we want?